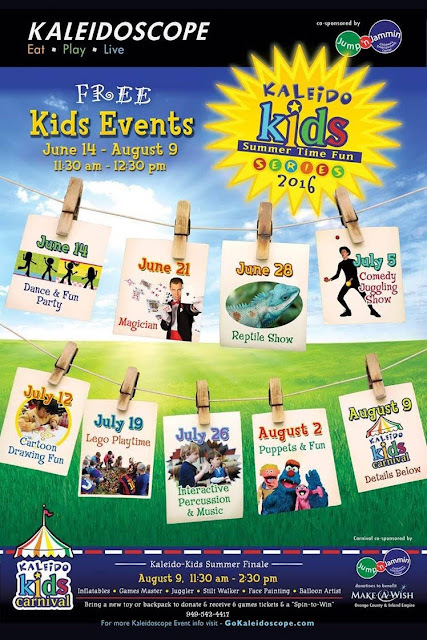 Local youngsters will enjoy a variety of free summer activities when the Kaleido-Kids Summer Time Fun Series returns to Kaleidoscope in June. Co-sponsored by Jump ‘n Jammin, the events are every Tuesday from June 14 through August 2, from 11:30 am to 12:30 pm., at the Mission Viejo center. The events will conclude with the Kaleido-Kids Mini Carnival on Tuesday, August 9 from 11:30 am to 2:30 pm., benefitting Make A Wish® Orange County and Inland Empire. The Kaleido-Kids Carnival will include inflatables, games, a juggler and stilt walker, face painting and a balloon artist. Tickets are $1 each, $5 for six, $10 for 15, and $2 for a “Spin to Win”. Guests who bring a new toy (no guns please) or new backpack to donate to Make-A-Wish will receive four game tickets and a “Spin to Win,” a chance to win prizes. Also on Tuesdays and Wednesdays throughout summer, Regal Theater at Kaleidoscope is hosting its annual Summer Movie Express, which features family movies (rated G or PG) for only $1 admission per person. The movies are shown on Tuesdays and Wednesdays at 10 a.m. from June 23 to August 19th. For a complete movie schedule, please visit www.gokaleidoscope.com. Make-A-Wish® grants the wishes of children with life-threatening medical conditions to enrich the human experience with hope, strength and joy. Founded in 1980 when a group of caring volunteers helped a young boy fulfill his dream of becoming a police officer, Make-A-Wish is one of the world’s leading children’s charities, with 62 chapters in the United States and its territories. With the help of generous donors and nearly 25,000 volunteers, Make-A-Wish grants a wish every 38 minutes and has granted more than 240,000 wishes in the United States since its inception. For more information about Make-A-Wish Orange County and the Inland Empire, visit www.ocie.wish.org and discover how you can share the power of a wish®. Kaleidoscope Center is a 245,000 square foot lifestyle center located at 27741 Crown Valley Parkway, just off the 5 Freeway, in Mission Viejo. The center offers popular entertainment, retail and restaurants, along with a variety of community events throughout the year. Kaleidoscope includes Edwards Cinemas, LA Fitness, Burke Williams, Sola Salon, Ortho Mattress, Islands Restaurant, Buffalo Wild Wings, Howie’s Game Shack, Laser Quest, Riptide Rockin’ Sushi & Teppan Grills, Maui Grills, Rocco’s Pizzeria, Rita’s Italian Ice, Yogurtland, AT&T, Bold Girlz, Jump 'n Jammin, and Color Me Mine. Union Market Mission Viejo is expected to open soon, offering 28,000 square feet of unique dining, specialty retail and event space.